My father was a British Merchant Seaman on the above two ships (British Merchant Ships Rathlin and Oronsey) during WWII. I cannot find any signifcant information about either ship. Having perused your articles, I gather that you might be the source of information I am seeking. There were two ships that carried the name of Oronsay, and no doubt your father served in the Orient Lines RMS Oronsay 1. Here is a report of a person who was evacuated from UK under the Children to Canada scheme in 1941. I am still trying to find detalis of this ship being built for you. 75 degrees 41 minutes North, 03 degrees 12 minutesEast, Rescue ships Rathlin and another such vessel picked up 32 crew, 11 armed guard, and 18 passengers. Rathlin was one of two rescue ships on the ill fated Russian Convoy PQ 17, and survived that trip, saving a number of merchant sailors. This is a start for you Michael with just a little about both ships in which your father served in WW2. 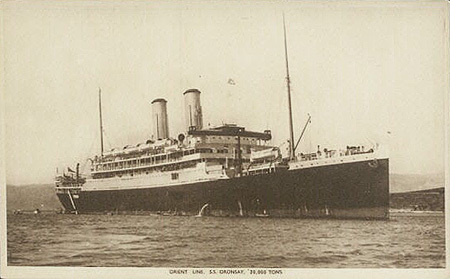 Here is a Post Card picture of Oronsay 1, she had been built in 1925, with a Gross Tonnage of 20,001 and was requisitioned as a Troopship in 1939, to be torpodoed in 1942 off Liberia. Many thanks both for the information and especially for the postcard. Now I finally have a photograph of the Oronsay Do you have any information about the actual demise of the Oronsay? I know that my father was not on board when it was sunk but I am sure that some of his former shipmates were involved and as a tribute to them and to his memory I would like to know more details. Again, thank you. Your efforts are a boon to the preservation of the history of that era. Oronsay was sunk on the 8th. of October 1942 off Freetown, West Africa, by the Italian Submarine Archemede, commanded by Lieutenant Saccardo, 5 crew members of Oronsay died, 26 were captured to become Prisoners of War, and 412 survived. Archemede was commissioned on the 18th. of April in 1939, and only sank 3 Allied ships in her career, she herself was sunk by a land based US Catalina, VP-83, when she was surfaced off Brazil on the 15th. of April 1943. The Catalina dropped bombs, then attacked with depth charges from only 50 feet, and in 6 minutes Archemedes had sunk. There were some 30 survivors from the Italian Submarine, the Catalina dropping some life rafts for these survivors. 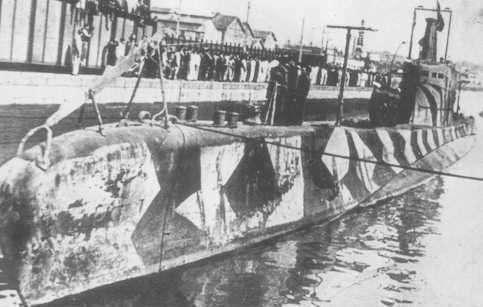 A photo of this Italian Sub is attached. Again, many thanks for your information. I am amazed that you know so much about all navys. Actually, about 20 years ago, I met a counterpart to you. He was retired US Navy and lived in Fayetteville, North Carolina. If my memory serves me correctly, his last name was Green or Greene. I believe his books had also been published. We were introduced by a mutual acquaintance by the name of Joe Haymore ("I've taken off in 3000 aircraft and never landed in one" Joe lives in Sandford, NC and is ex 82nd Airborne). (My ex wife was a US Army Lt stationed at Ft Bragg Hospital). Now you have piqued my interest and I am interested in finding out more about the Archimede. Also, was the Catalina which sank the Archemede US military, based in Brazil or was it Brazilian military? What do I owe you for the research and information you have provided? Please let me know.